Editor’s note: Last night I had the opportunity to check out Splitbreed along with JayEfKay and Hyper Crush. I spoke with Kalani and Bg3nius of Splitbreed. Great guys and it was cool to see where they were at with their career and where they were heading. As I was heading out, I asked about new music and Bg3nius told me about their free EP that is dropping right before the summer and Kalani mentioned this track. I had to get it up right away. I asked Nick to do a great article and he kills it. Check it out below! Umm, yes you are. I have to say I was hesitant at first, new music by artists I’m not expressly familiar with can be either hit or miss. Well they hit the nail on the head without a doubt. My first impression was that the vocals reminded me of Linkin Park in the way that it was almost like a rap but there were repeatable sections and obviously the tagline being the most important. Let me set the record straight though, I love Linkin Park. I absolutely love vocals in dance music, its usually what I connect with most given that my main genre is house. The vocals here aren’t used in the same respect, but it gives the listener something else for their ears to tune to. This can be terrible, a complex song with vocals can easily distract and detract from the overall feel, not here. The determined lyrics reinforce the strong bass elements and variable dub ‘wobbles’ that will quickly become fan favorites. This song brings elements from a few different genres right off the bat. I love the dubstep feel and the complexity is not easily attained, but perfected here. The portions that exist throughout the song are louder when the vocals play but softer as the mixing fills the empty vocal spaces. It certainly has a drum and bass feel with its obvious dubstep elements. One of the most vocal oriented dance tracks I’ve heard in a while, but it brings the song together well. 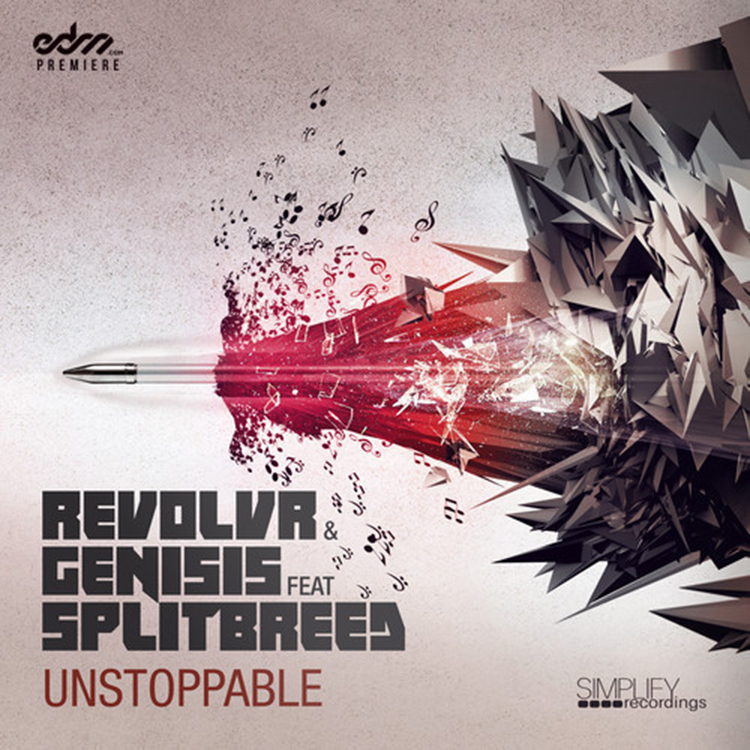 While ‘Unstoppable’ does not include a traditional dubstep drop, the bass hits extra hard after each vocal section, setting the stage for a fill of interwoven wizardry we call music. “Together we are unstoppable”. This is absolutely true of this track and I hope we see future collaborations of Revolvr, Splitbreed and Genisis. Great work to all of you. I will be following your next releases much closer as ‘Unstoppable’ shows the versatility of dance music and how it can appeal to anyone, regardless of preference.